Fire. Flood. Hurricane. Tornado. Have your ETS? - Perelandra Ltd.
during severe weather and disasters. Even if you aren't in the path of an impending natural or man-made disaster, read and print this information now. Keep it with your Disaster Bag. When you're in the midst of an emergency, you won't have time to search for these guidelines. have been affected by fire, severe storms, flooding, tornadoes and other disasters. receive news of an impending severe event in your area. have been ordered to evacuate your home. have loved ones with homes in areas affected by the disaster. are a first responder preparing for or already working in service, rescue and recovery efforts. And, keep your EoP Infusion Pump in your pocket! 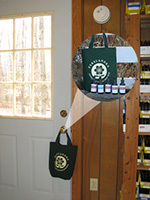 Gather your bottles of ETS for Humans (and ETS for Animals for your pets) right now, put them in a bag and hang the bag on the knob of your front door. That way, you will remember to take this vital support for you and your family with you when you go. Take one dropperful of ETS for Humans right away. Keep your ETS with you as you ride out the storm. 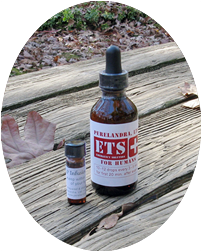 Take ETS for Humans 5 times daily. One time first thing in the mornings, one time in the evenings before going to sleep, and three more times throughout the day. Give them ETS for Animals 3 times daily (one dropperful per dose) until their lives settle back down. If you need more ETS before you leave, either for yourself or to have available for the people you're helping, let us know right away. We may be able to assist with our Crisis ETS Service. Call our Order Line at 1-800-960-8806. And remember, all military and emergency personnel including police, fire and rescue, EMT and emergency medical staff qualify for 25% off Perelandra Solutions and Essences for personal use. Remind your loved ones to take their ETS for Humans if they have it. You cannot underestimate the effects of a disaster on you mentally and emotionally, even when you're not in the middle of it. Your concern for others whether they're family or not, your worries while keeping up with what's happening . . . All of these types of things weigh you down. I am not saying that you shouldn't do these things. I'm saying that ETS allows you to do them without becoming dysfunctional at the same time.